The airport said all passengers were safe. 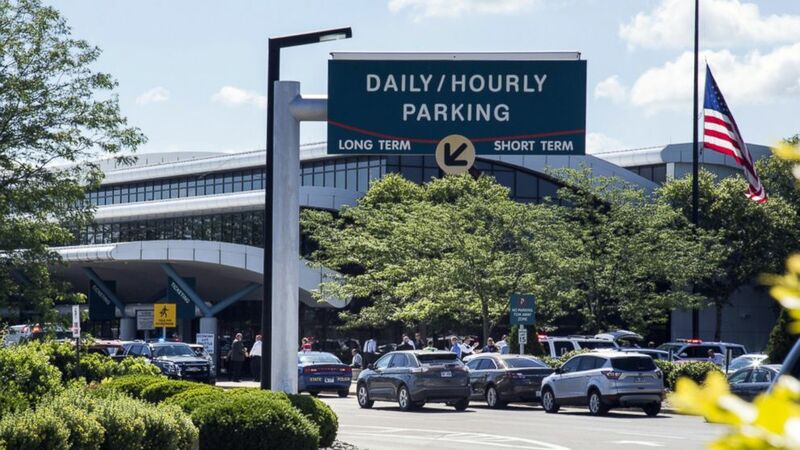 Authorities are investigating the stabbing of an airport police officer at Bishop International Airport in Flint, Michigan, on Wednesday morning, as an act of terrorism, David Gelios of the FBI said Wednesday. The police officer, Lt. Jeff Neville, was stabbed in the neck, and is in stable condition and expected to fully recover, officials said. 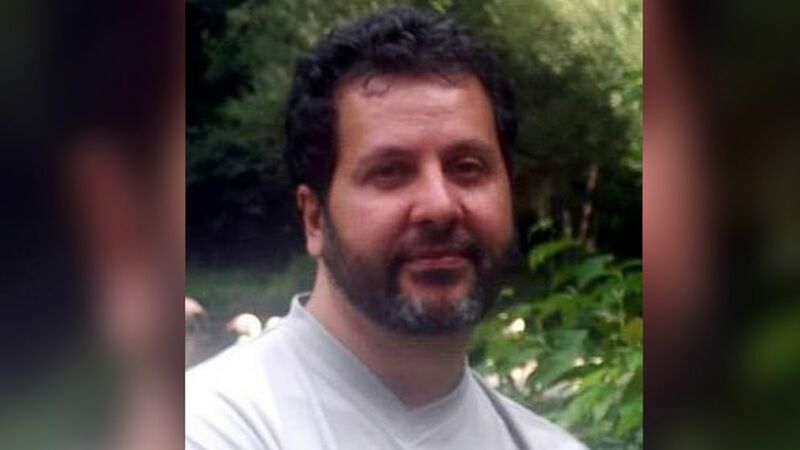 The suspect, who was taken into custody after the incident, was identified as Amor Ftouhi, 49, a Canadian man who legally entered the U.S. in Lake Champlain, New York, on June 16, and later traveled to Flint, Gelios said. (Amor Ftouhi/Facebook) Amor Ftouhi was taken into custody after allegedly stabbing an airport police officer at Bishop International Airport in Flint, Michigan, June 21, 2017. Officials said the suspect was outside the TSA screening area at the time of the attack. Ftouhi allegedly went into a public restroom, then dropped his bags and "came out, pulled out a knife, yelled 'Allahu Akbar' and stabbed Lt. Neville in the neck," Gelios said. Gelios said the attacker, armed with a roughly 12-inch knife with an 8-inch serrated blade, "continued to exclaim 'Allah' and he made a statement to the effect of 'you killed people in Syria, Iraq and Afghanistan,' and, 'We're all going to die.'" 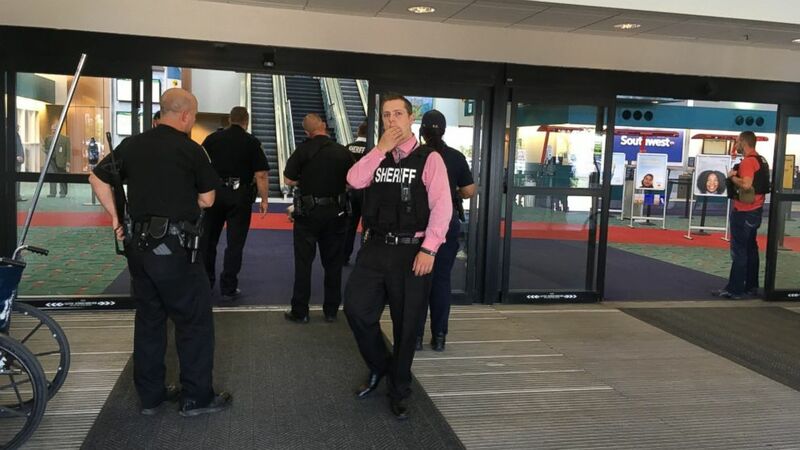 (Shannon Millard/Flint Journal-MLive.com via AP) The scene outside a terminal at Bishop International Airport, June 21, 2017, in Flint, Mich.
Officials said Neville got the suspect to stop the attack, and that "Neville never stopped fighting" until the suspect was in handcuffs, which happened within about one minute. The suspect was interviewed about his motivations and was cooperative, officials said. No one else appears to have been involved and there is no information to suggest a wider plot, officials said. Canadian police also searched an apartment in Montreal where the suspect is believed to have lived, authorities said. There's no indication that the suspect spoke to anyone before the attack, but police said they were questioning three people who had been staying at the Montreal residence, according to The Associated Press. 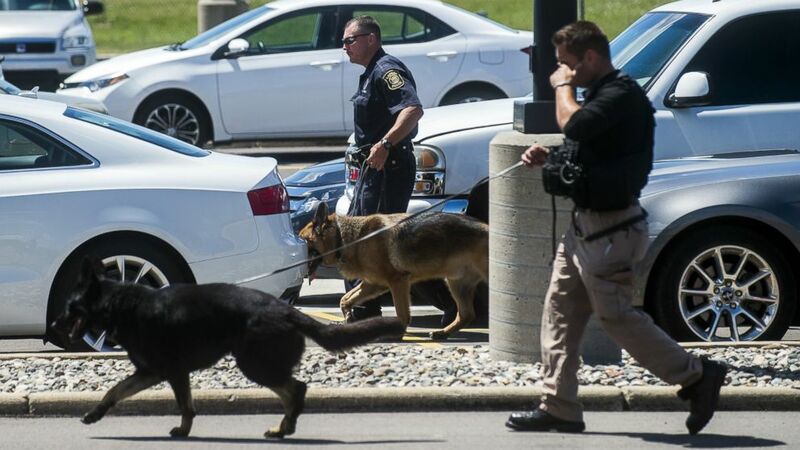 (Jake May/Flint Journal-MLive.com via AP) Police dogs search cars in a parking lot at Bishop International Airport, June 21, 2017, in Flint, Mich.
After the incident, a complaint was filed against the suspect for "violence at an international airport," but officials noted that there could be more charges in the future. The investigation is ongoing as a part of a joint operation with Canada, officials said. The airport, which was evacuated and shut down, was later reopened. All passengers were safe amid the investigation, officials said. (Dominic Adams/The Flint Journal-MLive.com via AP) Police officers gather at a terminal at Bishop International Airport, June 21, 2017, in Flint, Mich. Officials evacuated the airport, where a witness said he saw an officer bleeding from his neck and a knife nearby on the ground. On Twitter, Michigan State Police say the officer is in critical condition and the FBI was leading the investigation. An airport official said Wednesday afternoon that Neville is "doing fine" and "resting comfortably" at a hospital. The FBI said earlier, "We believe this to be an isolated incident" and there is "no specific, credible information that there is a threat to the Flint community." 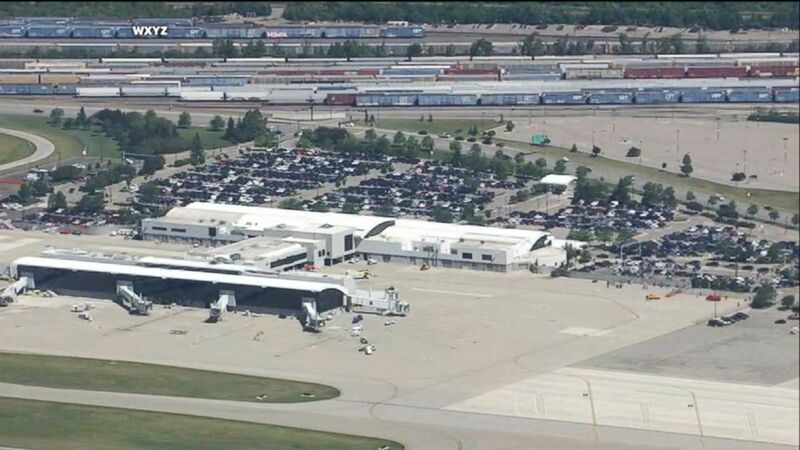 (WXYZ) The Bishop International Airport in Flint, Michigan, was being evacuated this morning after an airport police officer was injured, the airport said. Michigan Gov. Rick Snyder wrote on Twitter, "There is simply no room for senseless acts of violence such as this." "It is my hope that we can come together as one Michigan in the face of this terrible incident, just as people did today at Bishop Airport," Snyder said. "Even with this attack, we must continue to balance our need for increased security with understanding and tolerance." 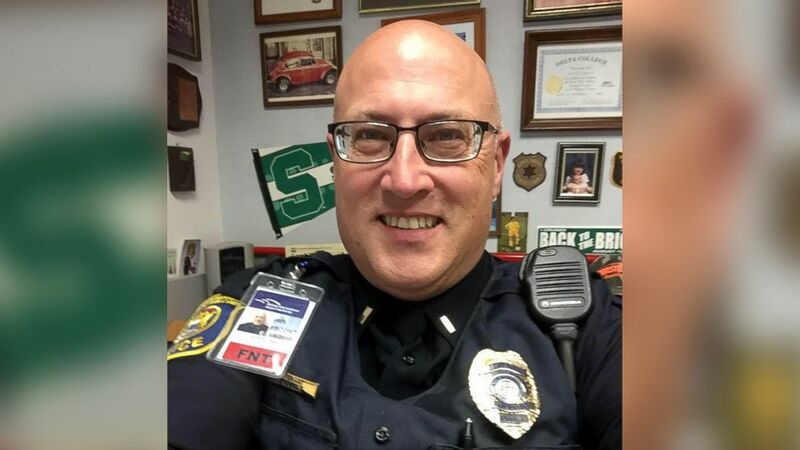 (Jeff Neville/Facebook) Lt. Jeff Neville, an airport police officer at Bishop International Airport in Flint, Michigan, was stabbed at the airport on June 21, 2017. Snyder also thanked all law enforcement officers and first responders and said he is "heartened to hear that Lt. Jeff Neville is expected to make a full recovery." The Canadian Department of Public Safety said in a statement, "We condemn this heinous and cowardly attack. The officer and his family and colleagues are foremost in our thoughts and prayers. ABC News' Jeffrey Cook, Rachel Katz, Karma Allen and Dominick Proto contributed to this report.